Aim: The aim of this study is to assess the effects of professional oral hygiene care in patients with head-and-neck cancer during radiotherapy, a clinical trial was done. Subjects and Methods: Forty patients were randomly assigned to either the experimental or the control group. For the experimental group, professional oral hygiene care, toothbrushing education, and fluoride varnish application were done once per a week, and for control group, only fluoride varnish application was done once per a week for 8 weeks during radiotherapy. Oral examination including plaque and gingival index was done at baseline and after 8 weeks. Results: The results demonstrated that plaque index was improved in the experimental group, but there was no significant difference between groups (P > 0.05). Plague and gingival status were significantly improved in both groups after 8 weeks compared to those of baseline (P < 0.05). Conclusion: Regular dental visit and professional oral hygiene care during radiotherapy were effective in oral hygiene and health among patients with head-and-neck cancer. Background: Malocclusion has been a problem since ancient times. Diverse factors influence malocclusion such as oral habits, anomalies in the dentition like changes in shape, position and number of teeth. But awareness and attitude about the problem differs within the neighborhood, depending upon their understanding and education. Hence, observation is essential to diminish and avoid the deleterious effects of malocclusion. Hence the objective of this study is to perceive the knowledge of youngsters and enlighten their perception on misaligned teeth. Methods and Material: A cross sectional study was conducted among 1000 young adults between ages 18-22 in Sathyabama University, Chennai, India. A questionnaire consisting of 24 multiple choice questions were given to the participants to assess their awareness, attitude towards malocclusion and orthodontic treatment. Descriptive statistics and chi square test was done using SPSS software version 20. The level of significance was set at 0.05. Results: More than 70% of the participants show concern and interest on self-image, 39.9% of the total study population were unhappy with the arrangement of their teeth. There was an overall lack of knowledge about the etiology and the effects of malocclusion among the participants. 60.2% of the population have not visited a dentist in the past 3 years. Many had false impressions towards orthodontic treatment. Conclusion: Awareness about the effects of malocclusion among young adults seems to be lacking. Most of the time, the treatment is neglected until the need for it arises. Background: Skin is the largest human organ, which performs a dynamic role in life. The ectodermal layers of the skin found on the palm with intricate lines are stable throughout life and have grabbed scientific attention. Any disturbances during their formation might possibly have the likelihood of a person developing malocclusion. Aims and Objectives: The aims of this study were to evaluate and compare the dermatoglyphic pattern with various skeletal malocclusions. Materials and Methods: The study was carried out on 40 outpatients reported with an age group of 18–20 years divided into four groups as follows: Group: I – 10 (Class I occlusion), Group: II – 10 (skeletal Class I malocclusion), Group: III – 10 (skeletal Class II malocclusion), and Group: IV – 10 (skeletal Class III malocclusion). 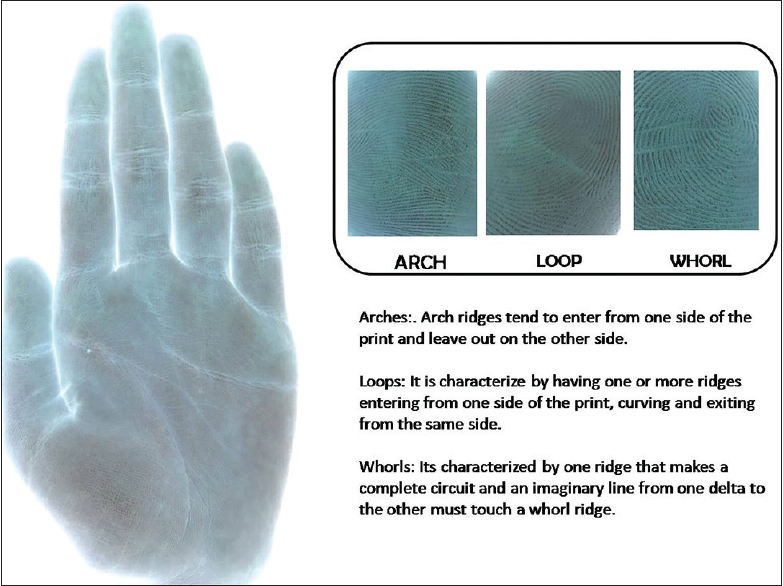 The fingerprints were recorded using scanner exclusively designed for diagnostic purpose of the study. The collected data were analyzed using SPSS statistics software Version 23.0 to find which groups had significant differences. Results and Conclusion: Increased frequency of arch pattern was present in participants with Class I malocclusion, and loop patterns were observed in those with Class I occlusion and Class III malocclusion and whorl patterns in Class II malocclusion with P < 0.05. Dermatoglyphic pattern remains constant throughout life and it can be used as a noninvasive aid in determining the development of malocclusion at a very early age. Background: Removal of the microbial organisms from the root canal system is a prerequisite for the successful outcome of any root canal treatment. Use of an effective intracanal medicament will assist in the disinfection of the root canal system. Intracanal medicaments have been used to disinfect root canals between appointments and reduce interappointment pain. Materials and Methods: A questionnaire survey was conducted to evaluate the knowledge, attitude, and awareness about the principal choice of intracanal medicaments among general dental practitioners and nonendodontic specialists. 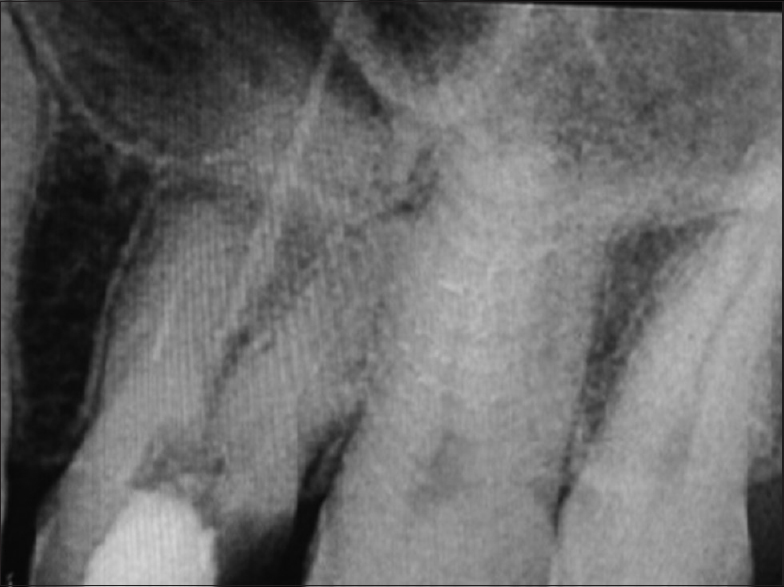 The questionnaire consisted of 11 questions related to intracanal medicaments in Endodontics. It was distributed to 75 general dental practitioners and 75 other specialists (nonendodontists). Results: In the present study, the authors observed that the knowledge level among the study participants was moderately satisfying. However, the need for more education of the dentists with regard to the intracanal medicaments was perceived. Discussion: Correct knowledge of intracanal medicaments would help the practitioners to decide the apt material of choice as intracanal medicaments in different clinical situations. 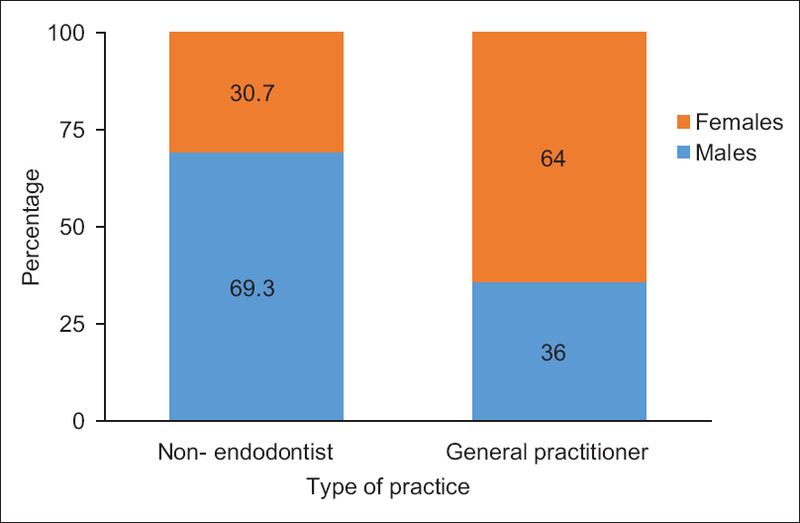 Conclusion: The present study highlighted the need for more continuing dental education programs with active participation of general practitioners and nonendodontic specialists to update themselves. Context: Bone-specific alkaline phosphatase (B-ALP), a product of osteoblasts, is a bone formation marker whose serum levels fluctuate with puberty and adolescence. Aims: This study aims to assess B-ALP levels in saliva and correlate it with different skeletal maturity stages of hand-wrist radiographs using Hagg and Taranger method. Settings and Design: Observational study and cross-sectional design. Subjects and Methods: Total sample comprised of 90 individuals, right hand-wrist radiographs, and 2 ml unstimulated whole saliva samples taken from each patient on the same day. The hand-wrist radiographs were traced and staged into 5 subgroups (18 individuals each) according to Hagg and Taranger method. Statistical Analysis Used: One-way analysis of variance (ANOVA) and Tukey's multiple post hoc test. Results: The comparison of salivary B-ALP values between the different skeletal subgroups using one-way ANOVA depicted statistically significant results (P = 0.0003). Pairwise comparison using Tukey's multiple post hoc procedures showed that salivary B-ALP levels were comparatively higher in subgroup 3 and that the difference between subgroups 1 and 3 (P = 0.0109) and subgroups 3 and 5 (P = 0.0014) was statistically significant. Conclusion: B-ALP could be successfully identified and quantitatively estimated in saliva and showed significant correlation with different skeletal age subgroups as determined by Hagg and Taranger method. Context: Eruption of first primary teeth is the most anxiously awaited developmental milestone in a child. However, primary teeth have shown wide variations in their eruption time among different population, ethnic, and racial groups. Aims: The present study was conducted with the aim to evaluate the time and sequence of eruption of primary teeth of children of Mysore. 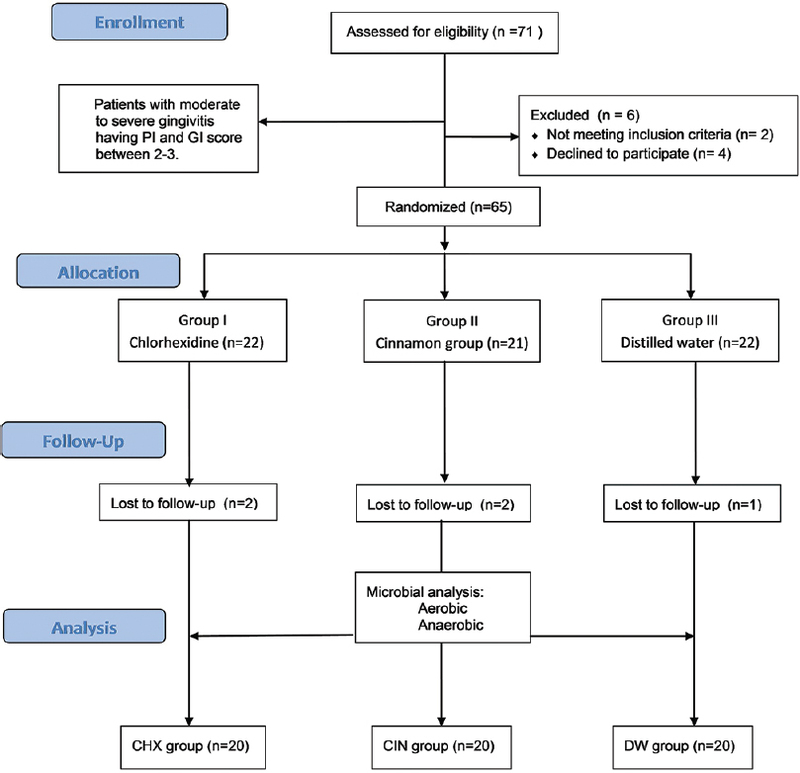 Settings and Design: A cross-sectional study design included 1392 participants aged 3 months to 36 months recruited by simple random sampling method. The variables such as age, gender, and number of erupted primary teeth were recorded. Subjects and Methods: Clinical examination was done under natural illumination. A tooth was considered erupted when any part of its crown had penetrated the gingiva and was visible in the oral cavity. Statistical Analysis Used: Probit regression analysis was performed to obtain the mean and median age of eruption of teeth. The significance of difference in the mean age of eruption across gender and arch was determined using paired t-test. Results and Conclusion: The first primary tooth to erupt was mandibular central incisor at 10.24 ± 2.47 months followed by maxillary central incisor at 11.06 ± 2.65 months. The duration of primary teeth eruption was 17.89 and 18.32 months in males, 18.54 months and 18.32 months in females for maxilla and mandible, respectively. Eruption of primary tooth is delayed among children of Mysore as compared to standard eruption chart. The results will provide information to health professional about contemporary tooth eruption time derived from an Indian population. Objectives: The main objective of the study was to assess the efficacy and safety of AHPL/AYTAB/1514 tablet in patients suffering from halitosis. Methodology: Fifty four patients were recruited in the study. Patients were advised to take maximum two tablets or at least one tablet four times a day (depending on tolerability of the drug) orally for 60 days. Patients were called for follow-up on day 15, 30, 45, 60, and 75. Data describing quantitative measures were expressed as mean ± standard deviation comparison of variables representing categorical data were performed using Chi-square test, Student's t-test, or Wilcoxon Sign Rank test. Results: At the end of the treatment, significant reduction in halitosis, gingivitis index, and dental plaque index was observed. 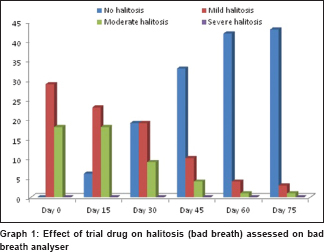 Even after stoppage of treatment for 15 days after 60 days of treatment, there was no relapse in halitosis. Few patients experienced sore throat, cough, and common cold during the study, which were resolved with the treatment of AHPL/AYTAB/1514 tablet. No significant change in vital parameters and most of the safety laboratory parameters were observed. No staining on tooth was observed in any patient. Almost all patients showed excellent improvement as per global evaluation done by the physician and patient. Almost all patients showed excellent tolerability to the study drug. Few patients showed mild AE, which were resolved without stoppage of study drug. Conclusion: The study provides good evidence in support of the efficacy and safety of the AHPL/AYTAB/1514 tablet in halitosis. Objective: The study compared the proximal contact strength (CS) of different fixed dental prosthesis (FDP) materials. Materials and Methods: Thirty volunteers participated in this study with definitive inclusion and exclusion criteria. Participants were divided into full metal, zirconia, and metal ceramic groups. The CS between the natural teeth and the maxillary posterior quadrant FDP was measured with force gauge. The data were evaluated with one-way analysis of variance test, and Tukey's honest significant difference post hoc was done to compare the mean values. Paired samples t-test was used to compare the mean values between pre- and postoperative CS. Results: The postoperative CS observed in the full metal group in premolar was 0.320 ± 0.1092 N and in second molar was 0.385 ± 0.1130 N. CS obtained with zirconia FDP in both premolar (0.679 ± 0.0927 N) and molar (0.770 ± 0.0960 N) was highest among all groups. The results were statistically significant (P < 0.001). Conclusion: Postoperative CS was greater in zirconia when compared with metal and metal ceramic FDP. Clinical Relevance: FDP materials had acceptable CS. Zirconia is preferable for optimal CS. Aim: The aim of this in vitro study was to evaluate and compare the effect of protective coating G-Coat Plus on microleakage of conventional glass ionomer cement (CGIC) and resin-modified glass ionomer cement (RMGIC) in primary molars. Materials and Methods: A total of 120 samples were divided into four groups with 30 samples in each group. Group A – teeth restored with CGIC. Group B – teeth restored with CGIC coated with G-Coat Plus. Group C – teeth restored with RMGIC. Group D – teeth restored with RMGIC coated with G-Coat Plus. Microleakage was tested using 2% basic fuschin dye penetration and measured at ×40 original magnification under the stereomicroscope. Results: The results of this in vitro study showed that coating with G-Coat Plus showed a reduction in microleakage in CGIC and complete absence of microleakage in RMGIC when compared to the noncoated groups, which was statistically significant. 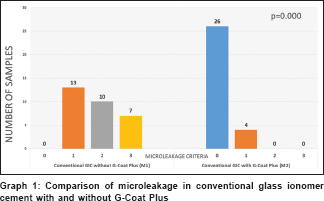 CGIC without G-Coat Plus showed highest microleakage followed by RMGIC without G-Coat Plus, followed by a relatively less microleakage in CGIC with G-Coat Plus. Conclusion: Significant reduction in microleakage was seen in conventional GIC and RMGIC with G-Coat Plus when compared to conventional GIC and RMGIC without G-Coat Plus. Background: Dental unit waterlines (DUWL) are believed to be a source of infection. Ultrasonic instruments generate aerosols with significantly greater numbers of bacteria. Chlorhexidine (CHX) exhibits significant antiseptic effect. Recently, cinnamon (CIN) has been displayed to have antibacterial and anti-inflammatory properties in vivo. Aim: The aim of this study is to compare and evaluate the efficacy of CHX versus CIN extract in the reduction of bacterial count in dental aerosols when used as an irrigant through DUWL during ultrasonic scaling. Materials and Methods: Sixty patients with moderate-to-severe gingivitis were randomly divided into 3 groups of 20 patients each undergoing ultrasonic scaling. 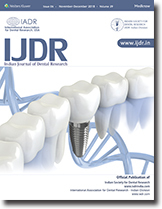 For experimental group I, CHX was added in dental unit reservoir before ultrasonic scaling. 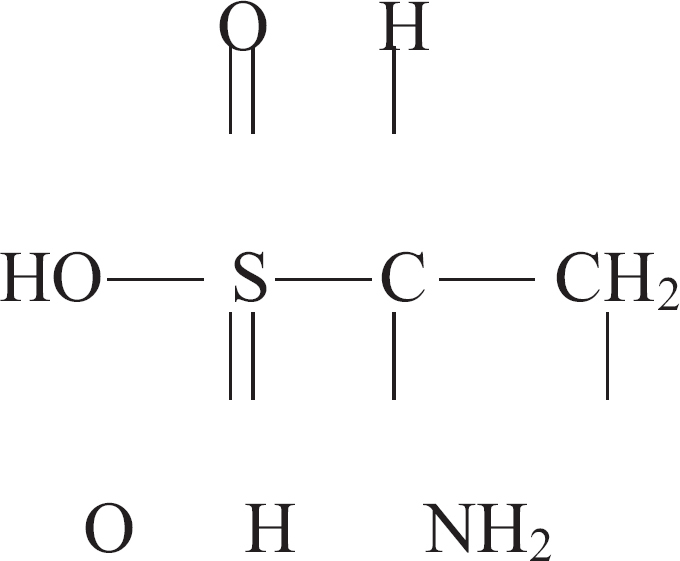 Similarly, in group II, CIN extract was used and group III served as control where distilled water (DW) was used. The aerosols from ultrasonic units were collected on two blood agar plates at three different positions. One plate from each position was incubated aerobically for 48 h and other plate anaerobically for 72 h. The total number of colony forming units (CFUs) was then calculated and statistically interpreted. Results: CHX and CIN both were equally effective (P > 0.05) in reducing the bacterial count in aerosols as compared to DW (P < 0.05) when used through DUWL. 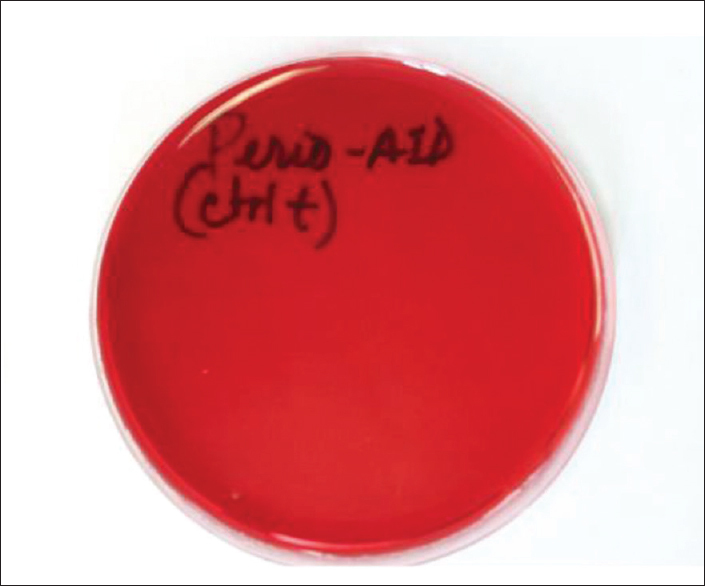 Maximum contamination was seen on the agar plate placed at the chest of the patient. Conclusion: Both CIN and CHX used as an irrigant through DUWL effectively helped in the reduction of bacterial count in dental aerosols. Context: The construction of a dental prosthesis needs the duplication of intermaxillary relationships of the patient on the articulator. This procedure is normally fulfilled using interocclusal records to program the articulator according to the patient's condylar inclinations. Wax is a popular recording material used for this purpose but has proven to suffer from inaccuracies due to its dimensional variation over time. Aims: This study intends to test the reproducibility of eccentric interocclusal wax records over time. Setting and Design: Thirteen dental students aged between 18 and 30 years participated in this study. 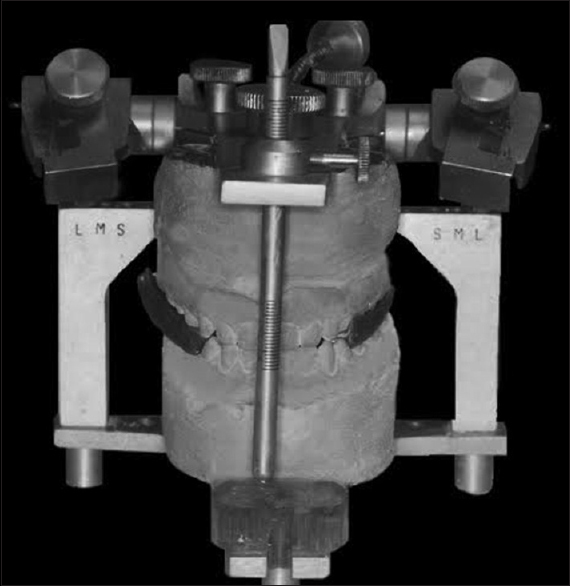 Maxillary and mandibular casts of the participants were mounted on two types of articulators; wax lateral and protrusive interocclusal records were used to program these articulators. Subjects and Methods: Horizontal and lateral condylar inclinations were obtained for each participant. The interocclusal records were stored for 10 days and the casts of each participant were remounted on the articulators. The interocclusal records were reused to obtain new condylar inclinations of each participant. The initial and the delayed condylar inclinations were compared to evaluate the impact of storage time on wax records. Statistical Analysis Used: Paired Student's t-test was used for this comparison. Results: No significant difference (0.38 < P < 0.92) was found between initial and delayed condylar inclinations for both articulators. An interclass correlation coefficient analysis was used to test the reproducibility of measures, and the correlation was significantly elevated (intraclass correlation coefficient >0.600). Conclusions: The use of wax interocclusal records for articulator programing was shown to be acceptable even with delayed intervals, without concerns of possible variations of condylar settings due to storage time. Background: Dental caries is a multifactorial disease in which microorganisms play an important role. Recently, herbs have been tried as mouthrinses to combat the side effects of chemical mouthrinses. The anticaries efficacy of Sodium fluoride, Tulsi leaf, and Black myrobalans fruit extracts on Streptococcus mutans (S. mutans) have been reported in the literature, but no comparative study has been done yet. 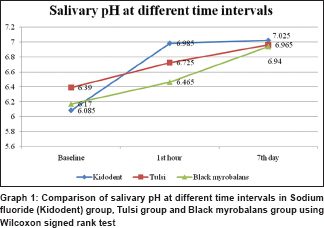 Aim: This study aims to observe the change in the pH of saliva and to assess the efficacy of the herbal rinses-Tulsi and Black myrobalans on S. mutans count while comparing it with Sodium fluoride mouthrinse. Methods: Herbal ethanolic extracts of Tulsi (4%) and Black myrobalans (2.5%) were prepared as mouthrinses and compared with sodium fluoride mouthrinse (0.05%). Sixty high caries risk patients were selected and allocated randomly into three groups [n = 20], categorized as Group A-Sodium fluoride mouthrinse, Group B-Tulsi mouthrinse, and Group C-Black myrobalans mouthrinse. They were instructed to rinse their mouth with their assigned mouthrinses for 7 days. Salivary samples were collected and sent to the laboratory at baseline, 1 h postrinsing and after 7th day of rinsing for determining the salivary pH and S. mutans count. The increase in pH and reduction of S. mutans were determined. The values obtained were tabulated and statistically analyzed. Results: There was a significant increase in the salivary pH and reduction in S. mutans count after rinsing in all the three groups. Increase in salivary pH was more in the Sodium fluoride mouthrinse when compared to the experimental herbal groups (Group B and Group C). While S. mutans counts reduced more with Tulsi mouthrinse at 1 h postrinsing and after the 7th day of rinsing more reduction was seen in Black myrobalans mouthrinse group. Conclusion: The results of the study suggest that herbal mouthrinses could be tried as an adjunctive anticaries agent against dental caries causing microorganisms. Background: The worldwide prevalence of cerebral palsy among live births is estimated to be between 1.9 and 3.6/1000. The presence of periodontal disease in cerebral palsy children typically is due to bacterial plaque accumulation caused by their inability to correctly clean their own teeth, difficulties in chewing and swallowing food, and improper movements of masticatory muscles and tongue muscles. Objectives: The objective of this study is to estimate the periodontal status in cerebral palsy individuals and evaluate the presence of Dialister pneumosintes. 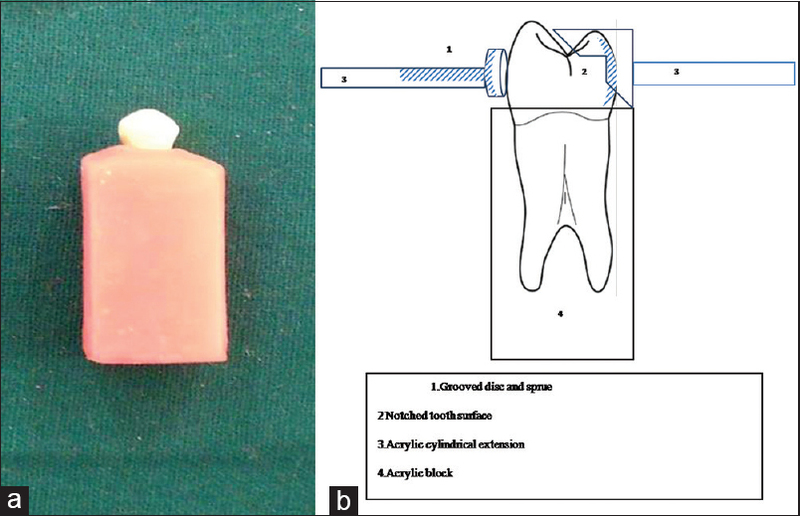 Materials and Methods: Thirty cerebral palsy children from the Spastics Society of Tamilnadu with signs of periodontitis were compared with the same number of age- and gender-matched controls for oral hygiene and periodontal parameters. Subgingival plaque samples were screened for the presence of respiratory pathogen D. pneumosintes by polymerase chain reaction (PCR). Results: A variation was noted between types of cerebral palsy individuals with a mean probing pocket depth value of 6 in spastic type, 4.86 in the ataxic, and 4.3 in the dyskinetic. Clinical attachment level varied from 6.71 in spastic to 5.43 in ataxic and 3.50 in dyskinetic. Oral hygiene index-simplified ranged from 2.764 in spastic to 2.25 in ataxic and 1.41 in dyskinetic. PCR results indicated 25% and 21.7% positivity for D. pneumosintes among cerebral palsy and control group, respectively. The odds ratio calculated to estimate the risk of periodontitis due to D. pneumosintes was 0.765. Conclusion: It was concluded that oral hygiene status and severity of periodontitis worsens as the rigidity and muscle tone limiting limb movement increases in cerebral palsy individuals. Background: Variety of substances such as tobacco, UV radiation, infrared rays, X-radiations, and chemicals on oral induction results in chromosomal aberrations and production of micronucleus (MN). Among them, tobacco-specific nitrosamines are potent mutagenic agents causing oral cancer. Objective: The objective of the study is to compare the genotoxicity in buccal mucosal cells, i.e. the MN count of all groups and to find the incidence of micronucleated cells (MNCs) in accordance to duration and frequency of tobacco usage and timing of contact of tobacco in the oral mucosa. Materials and Methods: Individuals without any oral diseases were divided into 3 groups having 25 in each group: smoking, chewing, and control. 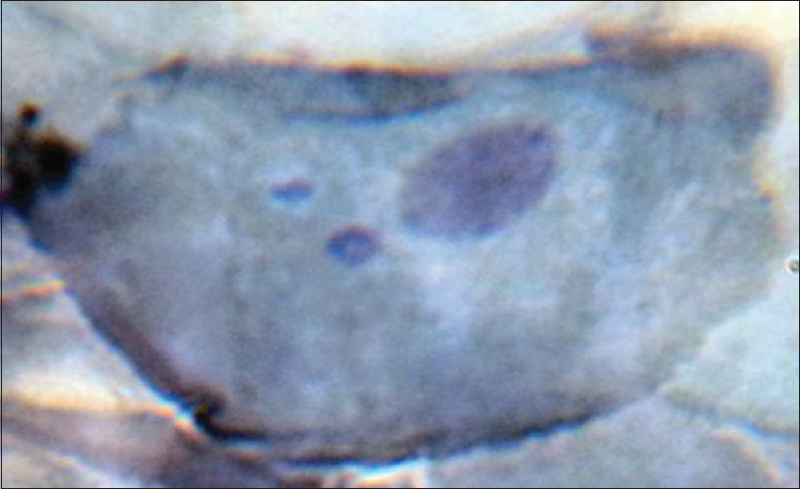 Smears were made from buccal exfoliated cells and stained with DNA-specific Feulgen stain. Frequency on MNC per 500 cells was assessed with one-way ANOVA and Tukey HSD multiple comparisons test and mean rank with Kruskal–Wallis test. Results: The mean micronucleus MN revealed that chewers had 8.00, smokers had 7.20 and controls had 0.4. The ANOVA test for mean frequency of micronucleated cell MNC revealed High significance (<0.001) for between groups comparison. The mean rank by Kruskal Wallis test revealed the MNC increases as the duration and frequency of habit increases. An increase in MNC in accordance to time of contact with buccal mucosa increases as the duration and time increases. Conclusion: Estimation of MN serve as an indicator of genetic damage and points that tobacco in chewing form induce genotoxic effect. This is studied in an easily accessible tissue- buccal mucosa in a non invasive manner. Context: Knowledge of the microbial composition of abscessed primary tooth is limited. Aim: The aim was to investigate the presence of 10 oral bacterial species in samples from abscessed primary tooth root canals using microarray technology and to determine their association with clinical findings. Subjects and Methods: The samples were collected from root canals of 20 primary molars with acute primer infection. The bacterial composition of the samples was semi-quantitatively defined using a microarray system (ParoCheck®). Clinical parameters included the presence of spontaneous pain, mobility, percussion sensitivity and swelling. Statistical Analysis: Data were statistically analyzed by Student' t-test, Fisher's exact Chi-square test, Freeman–Halton–Fisher's exact test, and Spearman's rho correlation analysis. Results: All the tested species were detected in the samples. Fusobacterium nucleatum was the most frequent bacterium (100%), followed by Parvimonas micra (65%), Provetella intermedia (45%), and Treponema denticola (45%). According to paired bacterial combinations, F. nucleatum was significantly positively correlated with P. intermedia and P. micra (P < 0.05). T. denticola was significantly positively correlated with Porphyromonas gingivalis, Tannerella forsythia, Campylobacter rectus, and P. micra, while it was negatively correlated with Eikenella corrodens (P < 0.05). No statistically significant relationships were found between the presence of any bacteria and clinical findings. Conclusion: Microarray technology used in this study has demonstrated the presence of various bacteria with varying proportions in the root canals of abscessed primary teeth. The results regarding the high rate of certain bacterial combinations suggest the enhanced pathogenicity due to additive or synergistic effects of these microbial combinations. Background: Biodentine™ is relatively a new tricalcium silicate cement that has gained great attention of the researchers due to its biological potential in comparison with other materials. The aim of this study was to investigate the optimum concentrations of Biodentine in relation to its stimulatory or inhibitory effect on proliferation, migration and adhesion of stem cells of human exfoliated deciduous teeth (SHED). The cell cultures of SHED were treated with Biodentine™ extract at four different concentrations; 20mg/ml, 2mg/ml, 0.2mg/ml and 0.02mg/ml. Cells cultured without Biodentine™ were kept as a blank control. The proliferation potential of SHED cells was evaluated by MTT viability analysis for 6 days. Migration potential was investigated by wound healing and transwell migration assays. The growth, survival and communication potential of these cells was determined by Adhesion assay. Results: A significant increase was observed in the proliferation and migration of SHED at (2mg/ml, 0.2mg/ml and 0.02mg/ml) while higher concentration of Biodentine™ (20mg/ml) exhibited cytotoxic effect on the cells. However, three tested Biodentine™ concentrations were similar in effect (non-significant) to adhesion ability of cells when compared with blank control. Conclusion: Our findings suggest that lower concentrations of Biodentine™ can be considered as the optimum concentrations to enhance the stimulatory effect of Biodentine on SHED. Context: Long-term retention of the restoration depends on strength and durability of the bond of the luting composite resin to the tooth and the porcelain substrates. Aims: This in vitro study was conducted to compare and evaluate the influence of hydrofluoric acid (HF) and acidulate phosphate fluoride (APF) gel-etched treatments on surface roughness and bond strength to dentin of a commercially available lithium disilicate ceramic (E-Max). Subjects and Methods: Sixty lithium disilicate ceramic disks measuring 5 mm in diameter and 2 mm thick were fabricated and divided into three groups: Group A (n = 24), Group B (n = 24), and Group C (n = 12) and were subdivided to Group A1, A2, and A3which were surface treated with 1.23% APF gel (pH = 3–4) at different time intervals 4, 7, and 10 min, respectively. Group B1, B2, and B3 were surface treated with 1% APF gel (pH = 1–2) at different time intervals 4, 7, and 10 min, respectively. Group C were surface treated with 9.6% HF (pH = 1–2) for 1 min. Morphological changes obtained with the surface treatments were analyzed using a surface profilometer. Statistical Analysis: All specimens were subjected to a tensile bond strength test using a tensometer, and the obtained data were statistically analyzed using Kruskal–Wallis test. Results: The surface roughness (μm) and bond strength (MPa) of lithium disilicate discs (samples) etched with 1.23% APF gel and 1% APF gel for 10 min and etched with 9.6% HF for 1 min showed no statistical significant difference among them. Conclusions: In this study, the lithium disilicate discs etched with 1.23% APF gel and 1% APF gel for 10 min showed similar surface roughness and bond strength to those etched with 9.6% HF for a minute. Aim: Chlorhexidine (CHX) mouthrinses are known to have a beneficial effect in the management of periodontal disease. The present study was designed to investigate the antibacterial, anti-inflammatory, and matrix metalloproteinases-8 (MMP-8) inhibition efficacy of eight commercially available CHX mouthrinses from the Dominican Republic. Methods: The study samples are categorized into two categories, eight commercially available CHX mouthrinses were case sample group, and positive and negative controls used in the study are categorized as control sample group. Antibacterial activity of the samples was evaluated on bacterial strains obtained from American Type Culture Collection (ATCC, Rockville, MD USA) which were Porphyromonas gingivalis, Fusobacterium nucleatum, Eikenella corrodens, and Aggregatibacter actinomycetemcomitans. Results: The study samples 1, 2, 3, 5, 6, and 8 showed significant higher antibacterial efficacy and sample 4 and 7 were less effective. 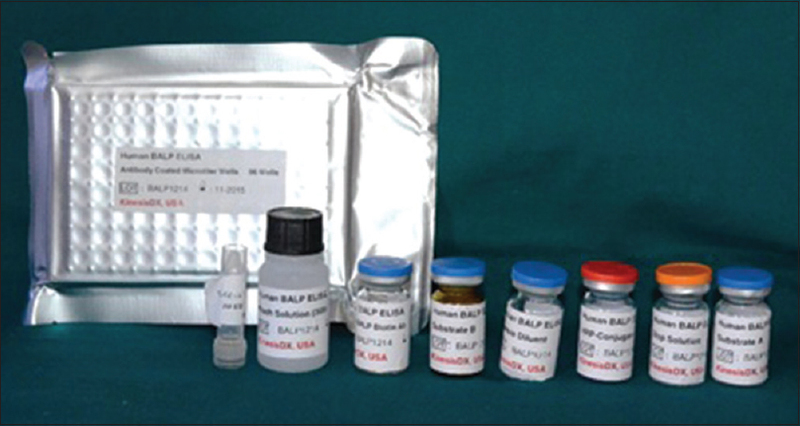 Samples 1, 2, 3, 5, and 6 showed higher antibacterial efficacy with no bacterial colonies formation in dilution assay method, whereas sample 8 showed smaller colonies of bacterial growth. The halo diameter found to be average in sample 8 with 13 mm, whereas sample 9 showed 12.5 + 3.48 mm, sample 1 was with a mean of 11.79 + 3.51 mm. The smaller halo diameter and minimal antibacterial activity were observed in samples 4 (mean of 3.5 + 5.95 mm) and 7 (3.5 + 7.70 mm). All eight samples showed statistically significant higher MMP-8 inhibition activity with P < 0.0001. Conclusion: Commercially available CHX digluconate mouthrinses showed the difference in plaque inhibition with 0.12 and 0.15% concentration. Taurine or 2-aminoethanesulfonic has many fundamental biological roles such as conjugation of bile acids, antioxidation, osmoregulation, membrane stabilization, and modulation of calcium signaling. It is essential for cardiovascular function and development and function of the skeletal muscle, the retina, and the central nervous system. Functions of taurine include osmoregulation; membrane stabilization; modulation of calcium levels; and antioxidation, antiapoptotic, anti-inflammatory, and antilipid activities. Taurine was first discovered as a component of ox (Bos taurus, from which its name is derived) bile in 1827; it had taken over a century before insights into its physiological functions were made. The present review throws light on the multifactorial properties of taurine and its potential to be used in periodontal therapy. Objective: This study aims to systematically evaluate the effects of traumatic occlusion on the periodontal tissue of rats. The set of questions to be answered were–Can traumatic occlusion acting on a healthy and an unhealthy periodontium cause periodontal destruction? Design: The protocols for systematic review were all developed, following the Preferred Reporting Items for Systematic reviews and Meta-Analyses statement and applied to animal research. Reporting of In vivo experiment guidelines for reporting animal research to assess the risk of bias of the studies. 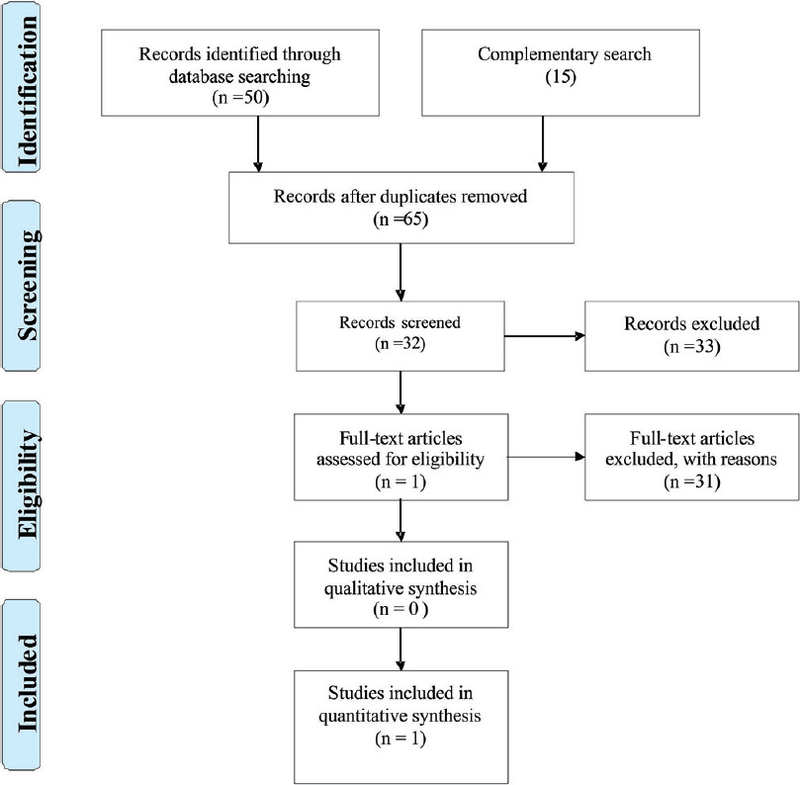 Materials and Methods: A literature search was conducted using MEDLINE through PubMed and manual search from the reference lists of main articles related to the theme. Results: This search strategy identified 65 references, of which 33 were considered inappropriate. The full texts of 32 articles were read, 31 of which did not meet the eligibility criteria and were excluded. The final selection included 1 article for which data was extracted for further evaluation. The article included shows a strongest reaction in the periodontium in front of a secondary occlusal trauma as inflammation and apical migration of the junctional epithelium, bone degradation, and decrease in the quantity of collagen fiber. However, primary occlusal trauma also presents these alterations, with the exception of apical migration of the junctional epithelium. Conclusions: Although only one study was included in the systematic review of traumatic occlusion, there is some evidence from experimental studies on animals that shows a coherent picture of the effects of traumatic occlusion on the periodontium. However, new studies are needed to fully answer the questions posed by this systematic review. Background: At a population level, there are no systematic data to correlate the pattern of prevalence of noncommunicable diseases (NCD) with oral disease burden in South Asian countries. The influence of the age, gender, and geographical distribution on these diseases is not reported. We attempt to provide a population level correlation of occurrence using the Global Burden of Disease approach. 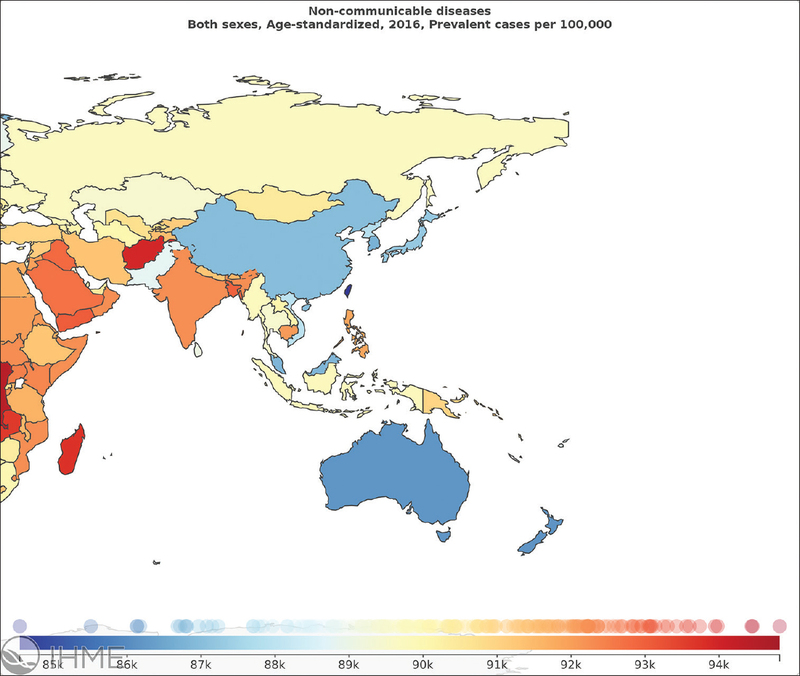 Materials and Methods: Using the data from the Global Burden of Diseases, 2016, the occurrence of oral diseases (dental caries of permanent teeth, edentulism (including severe tooth loss), and periodontal diseases) and various NCDs, based on geographical region, gender and age groups were collected and subjected to correlation statistics. Statistical Package for Social Services (Version 23) was used to analyze the results. P ≤ 0.05 was considered as statistically significant. Results: Geographical location and age had a significant role in the occurrence of dental diseases. There was a considerable difference in rates of dental diseases and NCD prevalence in the various regions of Asia-Pacific. It was observed that for most of the NCDs, there was a linear significant relationship for edentulism as well as periodontal diseases with high statistical significance. Discussion: The factors that contribute to the discrepancies, phenomenon, and relationship between the oral diseases and NCDs are discussed. The current state of the importance of oral health, in maintaining overall health is discussed. Methods by which policymakers could bring about a change by utilizing the principles of “Overton window” for mobilizing the support of people are presented. Ameloblastoma is a benign locally aggressive type of odontogenic tumor derived exclusively from the epithelium. Histologically, ameloblastoma is classified into many variants, of which granular cell ameloblastoma (GCA) is a rare type, characterized by nest of large eosinophilic granular cells. This article describes a case of GCA in a 50-year-old female patient with clinical, radiological, and histological features along with a systematic review of the literature. Radicular cysts associated with primary teeth are rare. 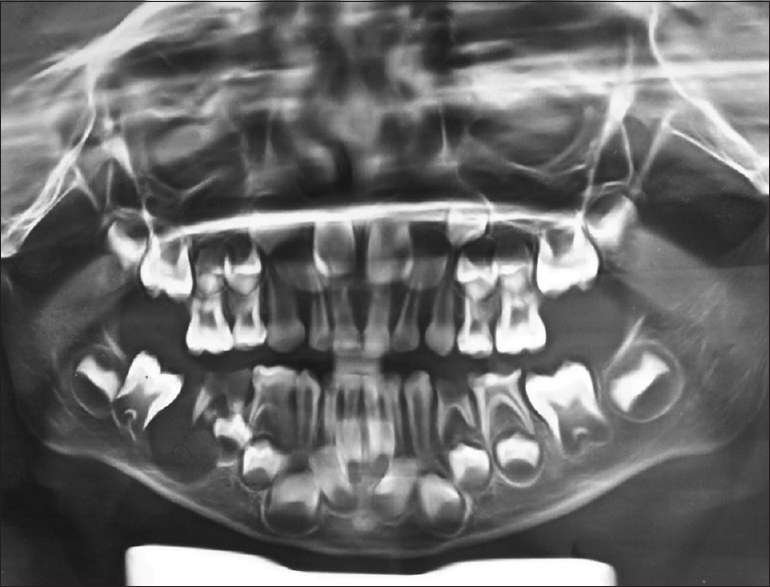 This case report describes radicular cyst associated with carious primary mandibular second molar in a 5-year-old patient and discusses its surgical intervention, space management, and follow-up for 3½ years. Exenteration surgery greatly affects a person in terms of function, esthetics, and psychological trauma. In such cases, restoration by silicone orbital prosthesis is a well-accepted treatment option. However, this is a difficult task, necessitating personalized design of method for each patient. 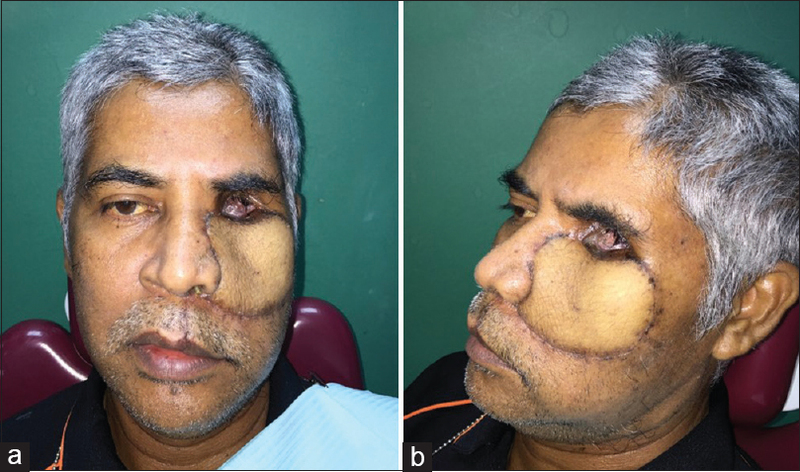 This case report describes the technique for fabrication of a silicone orbital prosthesis for a male patient with left orbital defect due to exenteration of a Grade 3 squamous cell carcinoma of the left eye and surrounding tissues. The patient was delivered with a satisfactory silicone orbital prosthesis having good retention and finish. Multidisciplinary management and team approach are crucial in providing precise and effective rehabilitation for improving the patient's quality of life and help them return to their normal social life. Angiokeratoma is a benign cutaneous lesion of capillaries. 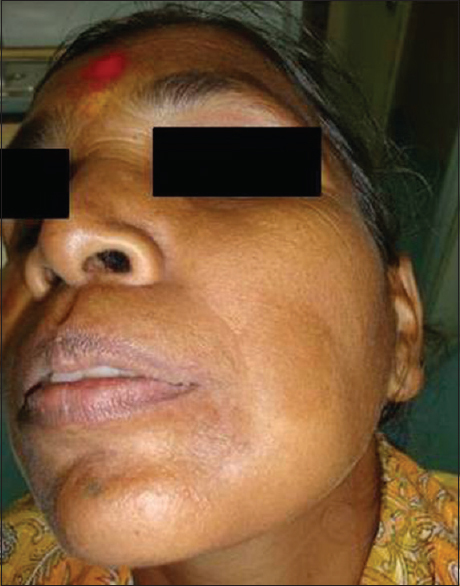 It is characterized by large dilated blood vessels in the superficial dermis and hyperkeratosis of extremities. It is mostly seen in generalized form affecting the extremity of the body, but we report this case of solitary angiokeratoma of the tongue which is a very rare type. Radiographic imaging is an important criteria in diagnosis, treatment planning, and follow-up of an endodontic treatment. When clinicians encounter with diagnostic difficulties and persistent symptoms, the need for advanced diagnostic aids, especially imaging methods, become imperative and essential. This paper reports a case, in which primary endodontic therapy having failed, the patient had persisting symptoms such as pain, swelling, and draining sinus along with signs and symptoms of maxillary sinusitis. Advanced diagnostic aids such as Cone Beam Computed Tomography was useful in accurate identification of the etiology, which was a fractured mesiobuccal root tip of maxillary molar. This is the first reported case, in which the fractured root tip has migrated to the maxillary sinus, during primary endodontic treatment, through the perforated antral floor causing odontogenic sinusitis. The operating microscope helped in the successful completion of endodontic retreatment along with fractured root fragment retrieval. Introduction: Traumatic orofacial injuries are frequent among hockey players, often causing aesthetic, functional, psychological, and economic problems. This study was conducted to assess the prevalence and distribution of orofacial injuries and to assess the knowledge, attitude and practices toward the use of protective wear as perceived among hockey players of Coorg district. Methods: A cross-sectional descriptive study was conducted among 281 field hockey players of Coorg district, Karnataka, India. Data were collected using a specially designed self-administered, pretested questionnaire containing a set of 19 statements. Chi-square test was performed to assess statistical significance among the variables studied. P value <0.05 was considered statistically significant. Results: The mean age of the study sample was 32.7 ± 4.3 years, and majority of them were semi-professional hockey players (46.6%) with an experience of 5–10 years (41.3%) of playing hockey and having at least a graduate qualification (65.5%). A total of 79% of the players reported to have been injured at least once in the past 1 year, of which orofacial injuries accounted for 33.8% of the injuries. Majority of the players had a fair Knowledge, Attitude and Practice (KAP) score toward the use of protective wear (63.7%). Although 37.7% of the players had good knowledge, it translated to a favorable attitude among 24.1% of the players and favorable practice among 11.7% players. Professional hockey players had a positive association with KAP scores (P < 0.00), whereas experience was found to be negatively associated with KAP scores (P < 0.03). Conclusion: The majority of players had moderate knowledge about the importance of protective wear in preventing orofacial injuries, but their attitude and practices toward the same were relatively poor. Context: Primary healthcare workers being grassroot workers in rural areas can be effective in oral health promotion in these areas. Aim: To assess oral health knowledge and practices among primary healthcare workers in Shimla district in Himachal Pradesh. Setting and Design: A cross-sectional study. Subjects and Methods: A cross-sectional study was conducted to assess oral health knowledge and practices of primary healthcare workers in Shimla using a self-administered questionnaire. Statistical Analysis Used: Data were analyzed using SPSS package version 16. The tests used were t-test and Fisher's exact test. A P value < 0.05 was considered statistically significant. Results: Of 130 subjects, there were 60 (46.2%) males and 70 (53.8%) females. The mean age of the population was 48.4 ± 5.9 with a range of 25–57. The mean knowledge score percent of the population was 51.9 ± 18.2. It was higher for males (52.3 ± 15.0) when compared with females (51.5 ± 20.7). The mean knowledge score percent was positively associated with education and negatively associated with age. Tooth brush was used by 97.7% and tooth paste by 121 (93.1%). The frequency of brushing twice was reported by 79 (60.8%). Conclusion: Though the overall knowledge about oral health is good among primary healthcare workers, the understanding about various aspects is lacking. Therefore, it is recommended that health workers should be given education to enhance knowledge and practices toward oral healthcare and to increase their screening capacity for common dental problem which will serve the community in long way.